Sleeperz Hotel Newcastle is a reinvention of a classic railway hotel in Newcastle city centre. The sleek glass fronted hotel opened on Newcastle’s Westgate Road in January on the site of a derelict former Parcel Works close to Central Station. Recently it was the winner of a Regional RIBA Award (Hadrian). Sleeperz Hotels, a fast growing innovative UK budget hotel operator, specialises in building stylish design-led hotels on unusually shaped land in city-centres near mainline railway stations. It opened its first hotel in Cardiff in 2008 and has plans to open new hotels in Birmingham, London and Manchester by 2015. (Newcastle, June 19 – 2012) Sleeperz Hotel Newcastle has been shortlisted for a prestigious award by the Royal Institute of British Architects. Sleeperz Newcastle – the 98-bedroom premium budget hotel near Newcastle Central Station – has caught the attention of judges at RIBA, whose awards honour buildings that achieve the highest architectural standards and make a substantial contribution to the local environment. The property has been nominated in the RIBA Hadrian Awards, the regional awards for the North East, from which the winners are put forward for the national RIBA Awards. The winners of those awards are considered for the RIBA Stirling Prize. 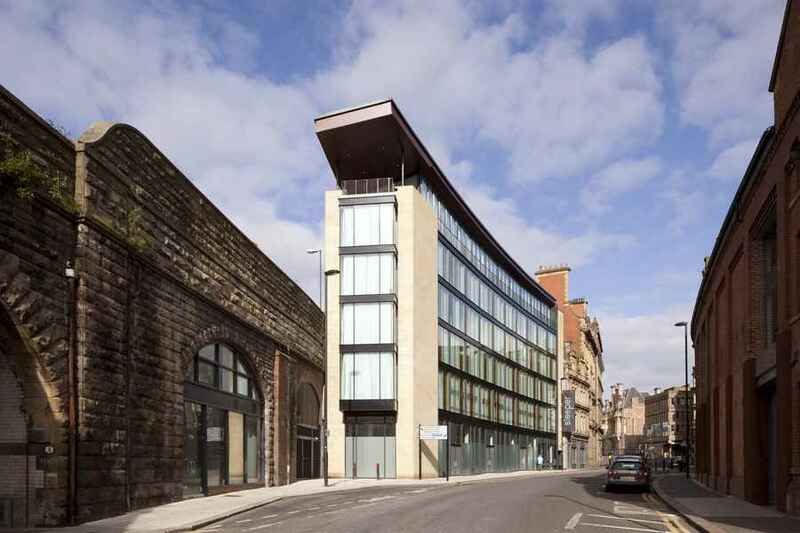 The hotel will find out whether it has won the award at the RIBA Hadrian Awards ceremony in Leeds later this month. 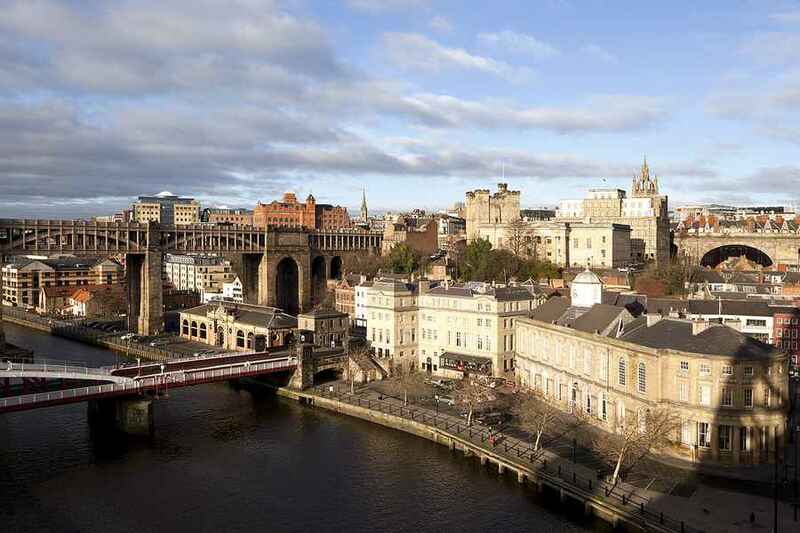 “Our Newcastle hotel is a welcome addition to the capital of the North East region. The building is sleek, modern and stylish and blends naturally into a city scape boasting iconic buildings and landmarks including Newcastle Castle Keep, St James’ Park football ground, the Tyne Bridge and the Georgian architecture on Grey Street,” said Mr.Myers. It is not the first time that Sleeperz approach to building hotels has caught the attention of RIBA. In 2010, its landmark Cardiff hotel won the RIBA Wales Award. Martin Knight, chair of the RIBA Awards judges. Both the Cardiff and Newcastle properties are designed by award-winning architects Clash Associates, who have succeeded in making the hotels into modern, highly-visible and instantly recognisable buildings. 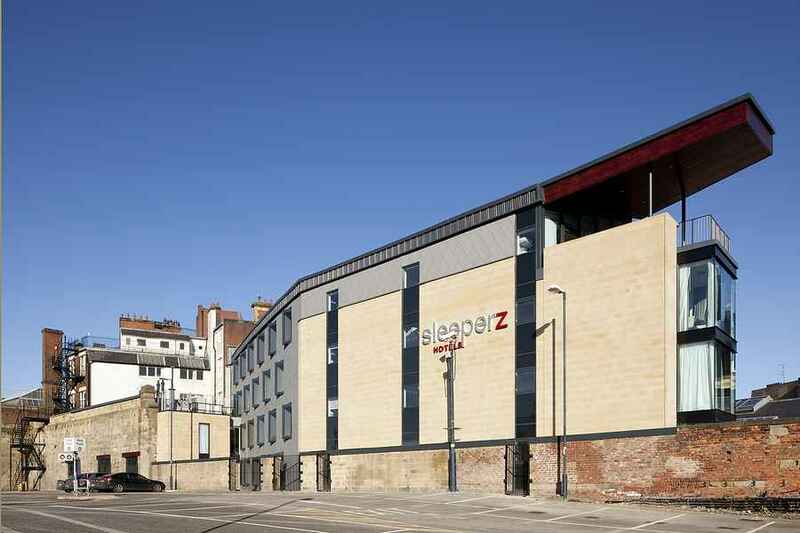 Innovative budget hotels business Sleeperz has begun work on developing its second UK hotel – on a city centre site in Newcastle. The 98-bedroom, six-storey hotel will be built at the bottom of Westgate Road, close to the city’s Central Station, with accommodation aimed at both the business and leisure traveller. Working closely with Network Rail, Sleeperz will develop a highly visible and recognisable landmark hotel on the former Parcel Works site, alongside the car park of Newcastle Station. Preparation work has already started on site with full construction expected to begin in October. Sleeperz is targeting an opening date of October next year, with the new hotel creating around 25 full-time jobs in the city. The construction of the company’s second UK hotel follows the announcement of a major £7m investment in Sleeperz Hotels to fund future growth – with the target of achieving a portfolio of 10 hotels by 2015. Just 18 months after opening the first in a new generation of compact lifestyle hotels – in the Welsh capital of Cardiff – Sleeperz is not only rolling out its plans to build in the capital of the North-East, but also earmarked five further sites for development next to mainline rail stations, including Liverpool, Birmingham and Manchester. Sleeperz Hotels Chief Executive David Myers said the Newcastle development will mirror the same ethos of compact and comfortable rooms at an affordable price in a stylish environment that has proved to be such a success in Cardiff. “As with Sleeperz hotel Cardiff, we will create quality high specification compact rooms with fresh, colourful and contemporary interiors. All of this will be available to the consumer at room rates, including free wi-fi, from £50,” he said. The equity finance has been raised from the company’s current investors, including Andre Hoffmann, and a new investor, Connection Capital. The debt finance for the Newcastle development is being provided by The Co-operative bank. Mr Myers said: “Raising finance is very tough in this market, and to secure £7m of investment via bank and equity finance is an exceptional achievement, particularly for a hotel business of our size. “The finance we have secured will not only fund the Newcastle hotel development, but also provide working capital for the further expansion we have planned. The hotel market is littered with single-site niche businesses that have failed to expand and progress to develop a second hotel. “There are so many positives in the Sleeperz brand. Not only have we managed to buck the trend in an increasingly challenging market – but in sticking to our ideals of convenience, value and style, are now driving on to growth and expansion. Sleeperz, which has sites in Cambridge and Cardiff, attracted funding from existing backers including Andre Hoffmann, vice-chairman of Roche, the Swiss drugs group, and William Kendall, previously chief executive of Green & Black’s chocolate. New investors supporting the fundraising include Connection Capital, a recently launched private equity firm that invests funds from high-net-worth individuals. It contributed £1.2m. Sleeperz, headed by chief executive David Myers, builds on land owned by Network Rail and pays it a share of its takings. The rail group is not a shareholder. Clash Associates’ design for a new Sleeperz Hotel at Newcastle Central Railway Station was awarded full planning on 3 October 2008. The six storey 95 bedroom hotel and office development was recommended for approval by planning with the full support of English Heritage, who considered that the new building would have a positive and beneficial impact on the character and appearance of the central conservation area. This is the third hotel designed by Clash Associates for Sleeperz, a new and independent hotel company focussed on reinventions of the traditional railway station hotel. The hotel will bring diversity and interest to the area, with its associated mixed use development contributing to the character of the street and the existing station buildings. Construction is expected to commence during 2009. Sleeperz Newcastle will occupy a prominent triangular site on Westgate Street, replacing an existing derelict parcels office. Clash Associates’ design for Sleeperz Newcastle refers to the former building through the proposed use of timber in its construction, its scale and respect for the context of the streetscene. The site is on the edge of the busy central area known for its business and commercial use and active nightlife. Sleeperz is developing a number of schemes in conjunction with Clash Architects for hotels at mainline station locations. Sleeperz Hotel in Cardiff is scheduled to open in November 2008, and the new Sleeperz at Manchester Piccadilly will shortly go on site. Clash Associates is currently preparing a detailed planning submission for a new 172 bedroom Sleeperz hotel at Birmingham New Street Station. Clash Associates Architects is an architectural, urban and landscape design practice based in Central London. The practice has produced a diverse range of work at different scales, including urban planning, transport, bridges, landscaping, sports, arts and leisure projects, both in the UK and overseas, with projects undertaken in Holland, France, China, and the Far East. Recent projects include the Level Centre in Rowsley, Derbyshire and soon to be completed Sleeperz Hotel in Cardiff.